MGJ had a really funny day and the whole school went crazy for charity. As well as some fantastic costumes and Red Nose decoration (thank you parents and teachers) children enjoyed a special Red Nose Lunch cooked by the kitchen staff. Pizza topped with some delicious red tomatoes followed by shortcake with you guessed it, some red nose cherries, went down well with everyone. Later in the lunch break teachers put on a fabulous display of cakes and biscuits, some expertly baked by the teachers themselves. Queues of excited children waited their turn to buy from an improvised shop in the school library. All in all another wonderful effort by all at MGJ to raise money for charity and have a great day. 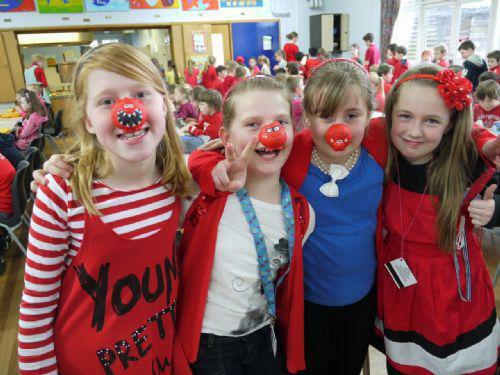 £679 was raised from Red Noses, cake sale, mufti and a special collection at the Young Voices.